It's Time to Order the March Issue! Pre-orders for our March 2018 issue are now open. Featuring cover art by Toronto collage artist, Nicole Moss. Orders must be placed by noon EST on February 20, after which we will be accepting pre-orders for our eighth issue. Shipping & taxes are included in the price. 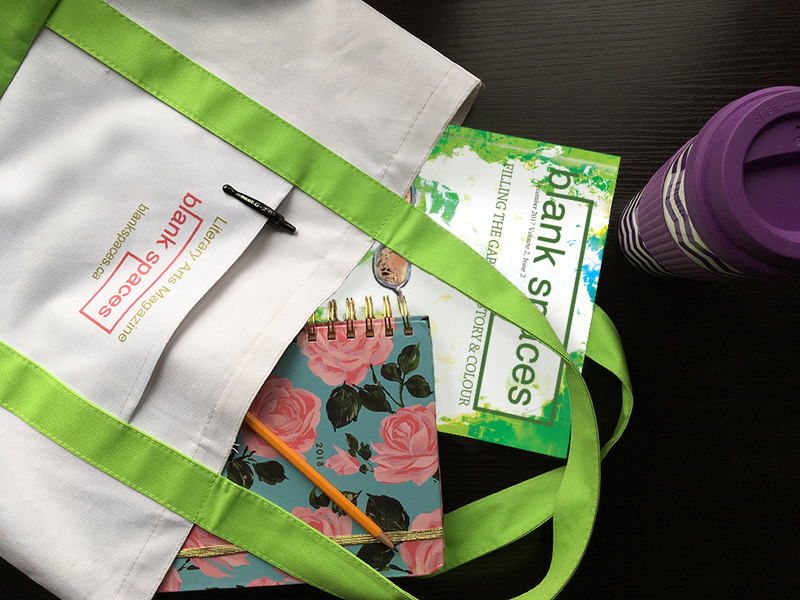 Interested in the Blank Spaces tote featured in the image? Click here to order your own! OR - if you're doing more shopping on our site (add a tote, notebook, or t-shirt to your order), add your preorder to your cart and pop over to our shop: Pre-orders should arrive at the beginning of March. Do you want to pre-order more than one copy of this issue? That's amazing! Thank you for the support! Just send us a quick email (blankspacesmag@yahoo.com) and let us know how many you'd like. We'll whip up a quick invoice and send it off to you, and as soon as your payment has cleared your order will be in the queue! Featuring the work of Sharon Barr, Simon Broder, Richelle Forsey, Bev Hopwood,, Tony Kicinski, Alan MacLeod, Nicole Moss, Olivia Sapp, Tsara Shelton, Susan Siddeley, and more! ALSO AVAILABLE: SKIP THE PRE-ORDER LINE! Sign up to be billed quarterly, ensuring you receive every new issue without worrying about missing the pre-order sale. This Review of our First Anthology Says it All.